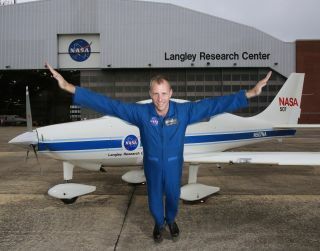 NASA research pilot Greg Slover spreads his arms like wings at the Langley Research Center to celebrate National Aviation Day. NASA is inviting the public to celebrate National Aviation Day on Aug. 19 with a social media campaign. Call all fans of flight! According to NASA, it's National Aviation Day today (Aug. 19) and the space agency wants you to celebrate the technological marvel that is flight with a photo social media campaign. NASA's logo for National Aviation Day 2015, which occurs on Aug. 19. To celebrate that aviation legacy, NASA is urging members of the public to snap photos of themselves with their arms spread wide like the wings of an airplane (it's National Aviation Day, after all) and post them on social media using the hashtags #SpreadYourWings and #NationalAviationDay. You can see NASA's guide to the National Aviation Day celebration here. The space agency plans to pick its favorite photos from the public and post them online at http://www.nasa.gov/aeronautics on Thursday, Aug. 20. "Why is NASA celebrating National Aviation Day? Because we love everything about flight, whether it's through space or Earth's atmosphere," NASA officials wrote in a statement. They also put together a list of NASA's 10 Favorite Ways to Celebrate National Aviation Day as well. "We've helped air travel become a safe, reliable form of transportation," NASA officials said. "But we're not finished. We're working to transform aviation into something even better by perfecting new technologies, including those that could lead to shape-shifting wings, electric propulsion and the return of commercial supersonic flight." NASA newsletter editor Doreen Zudell poses for a #SpreadYourWings photo to celebrate National Aviation Day 2015 at NASA's Glenn Research Center in Ohio. NASA engineers are working to develop new aviation technologies at several of the space agency's centers across the country, including the Armstrong Flight Research Center in California, Glenn Research Center in Ohio and Langley Research Center in Virginia, among others. "Every U.S. commercial aircraft and every U.S. air traffic control tower has NASA-developed technology on board," NASA officials said. "So, remember -- NASA is with you when you fly!"